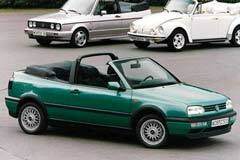 In 1995 Volkswagen introduced the VW Cabrio in order to take the place of the Cabriolet. The Cabrio was produced using the same platform as the Golf Hatchback and the Jetta. Customers were drawn to the Cabrio for its youthful appeal and surprisingly roomy interior. Most versions of the Cabrio came equipped with a 2.0 liter engine, capable of producing 115 hp. Buyers also had the option of a four speed or five speed transmission. In addition, a fixed rollbar and a long list of other features came standard on the vehicle. However, its most popular feature is the convertible top. Customers looking to buy a used Volkswagen Cabrio will find that only models produced after 1998 were equipped with power tops. Earlier versions still contain manual tops that were tightly sealed on all sides. The convertible top is multi-layered and weatherproofed and includes a glass window for added visibility. Overall, the Cabrio has scored well with its handling and fuel economy, but later versions of the vehicle ranked low in the maintenance department. 1985 Volkswagen Cabrio 1985 Volkswagen VW Cabriolet 2 Owner Original Car-Drives Like New!